I think it’s great. I’m not really good at putting things together, but I didn’t have any problem with it. All my shoes fit on it . 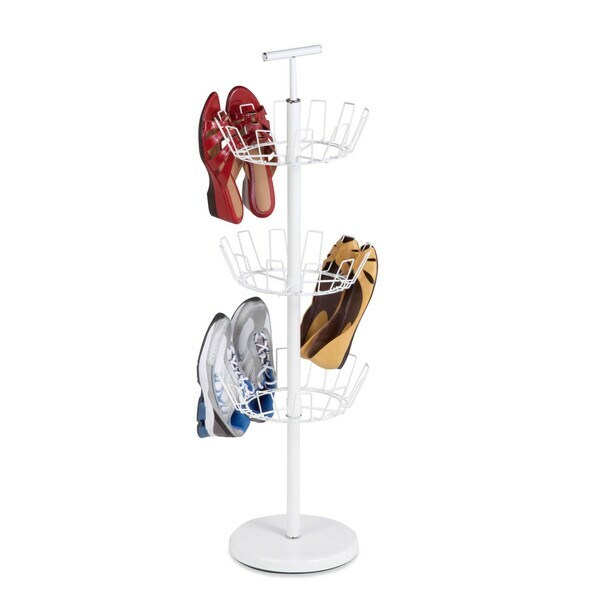 Go vertical and store up to 24 pairs of shoes on this brilliant white, spinning shoe tree. With only a single square foot of floor space required, you can reclaim your room and keep your shoe collection accessible and organized. All four levels revolve separately and adjust in height to accommodate small and large shoes, which gives you a flexible storage solution and easy access to every pair. Measuring 40H x 11.4W, the durable steel construction withstands daily use. Some assembly required. This item is a great space saver , the finely constructed white finished metal looks sleek , and adjustable racks for your shoes makes it a true treasure instead of boxes of shoes in my closet ,or under furniture everything up to 36 pairs of shoes fit on this adjustable tree . I love it ! My husband and I do a lot of gardening and leave our "gardening" shoes outside in the garage. I was so tired of tripping on the shoes. Now I have place for our nasty outside shoes that I don't want coming into the house. We'll see how long it holds up being out in the garage in Florida though. . . Overall, directions were pictorial only and were easy to follow. I bought this because it holds a lot of shoes and takes up a small amount of space. Great for a tight safe. It holds 24 pairs of my shoes. Delivery was fast. Setup was easy and no tools were needed to set it up. I love it and it is a great product. great space saving shoe rack. This is great--thin and easy to put together. I did it myself. It does not take up too much space. Very nice. Good and sturdy. I choose this one because I have a limited space in my studio apartment. This will fit in my small closet perfectly.